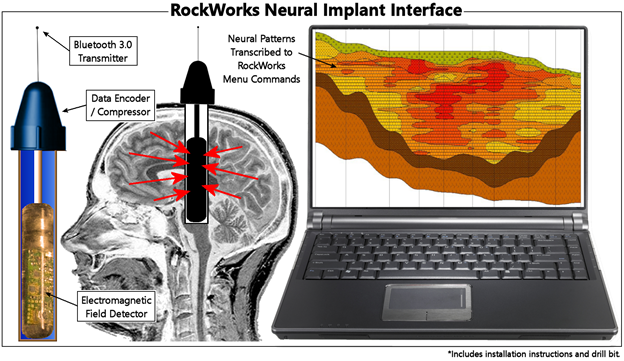 RockWare is pleased to announce the immediate availability of the “RockWorks Neural Implant Interface”. This optional add-on to RockWare’s flagship product, RockWorks, provides an alternative means for selecting options and settings from the various RockWorks programs. According to RockWare’s head of development, Dr. Ferd Burble, “Our most common technical support questions typically boil down to asking why RockWorks can’t read the user’s mind. This device will address these issues and provide for a more intuitive user experience”. Please contact RockWare to place your order today!